the lipoproteinaceous envelope in vertebrates surrounding most axons larger than 0.5-mcm diameter; it consists of a double plasma membrane wound tightly around the axon in a variable number of turns and supplied by oligodendroglia cells (in the brain and spinal cord) or Schwann cells (in peripheral nerves); unwound, the double membrane would appear as a sheetlike cell expansion devoid of cytoplasm but for a few narrow cytoplasmic strands corresponding to apparent interruptions of the regular myelin structure, the incisures of Schmidt-Lanterman. The myelin sheath of each axon is composed of a fairly regular longitudinal sequence of segments, each corresponding to the length of sheath supplied by a single oligodendroglia or Schwann cell; in the short interval between each two neighboring segments, the nodes of Ranvier, the axon is unmyelinated even though it is enclosed by complex, fingerlike, membranous expansions of the neighboring oligodendroglia or Schwann cells. The insulating envelope of myelin that surrounds the core of a nerve fiber or axon and facilitates the transmission of nerve impulses. In the peripheral nervous system, the sheath is formed from the membranes of Schwann cells, and in the central nervous system it is formed from oligodendrocytes. Also called medullary sheath. a segmented fatty lamination composed of myelin that wraps the axons of many nerves in the body. The usual thickness of the myelin sheath is between 200 and 800 μm. Various diseases such as multiple sclerosis can destroy myelin wrappings. The lipoproteinaceous envelope in vertebrates surrounding most axons of more than 0.5 mcm diameter; it consists of a double plasma membrane wound tightly around the axon in a variable number of turns, and supplied by oligodendroglia cells (in the brain and spinal cord) or Schwann cells (in peripheral nerves). Layers of the cell membrane of Schwann cells (peripheral nervous system) or oligodendrocytes (central nervous system) that wrap nerve fibers, providing electrical insulation and increasing the velocity of impulse transmission. Fig. 226 Myelin sheath . Transverse section of a myelinated nerve fibre. a sheath of fatty substance associated with protein which surrounds larger nerve fibres of vertebrates. see DENDRITE. The white lipid coating is produced by SCHWANN CELLS. The sheath permits a greater current flow and thus speeds the transmission of nervous impulses. 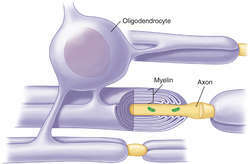 Constrictions in the myelin sheath, known as nodes ofRanvier, indicate the division between one Schwann cell and another. Nonmyelinated fibres occur commonly in invertebrates, internally in the spinal cord of vertebrates, and in the AUTOMATIC NERVOUS SYSTEM of vertebrates. Myelinated fibres, white in appearance, occur outside the spinal cord of vertebrates. The cover that surrounds many nerve cells and helps to increase the speed by which information travels along the nerve. For each block the fiber diameter axonal diameter and myelin sheath thickness were determined by at least 50 nerve fibers. From his earlier work on the inflammation and cell death that results from iron (and other heavy metal) build up in legs, he hypothesized that the myelin sheath destruction happens because the excess iron attacks the veins in the cranium which produces inflammation and an immune response. Deletion, overexpression, or mutation of CNP, PMP22, and MAL all result in defects in myelination and/or myelin sheath stability, which further demonstrates their importance in myelination (e.
The interpretation of different thickness of myelin sheath and lamella of perineural cells are not yet completely defined. The myelin sheath that circumscribes the peripheral motor neurons is destroyed. Elsewhere, electron microscopy studies have shown loss of myelin sheath integrity and abnormal inclusions in its lamellae in older schizophrenics. The pale areas of fibrosis that were observed on light microscopy corresponded to regions of active demyelination, as indicated by accumulations of myelin debris and the presence of large-diameter axons that were devoid of myelin sheaths (figure 3). Doctors can check the function of the myelin sheath by measuring the speed with which nerve impulses travel from one point to another along a nerve. T cells, B cells, and macrophages that are thought to lead the attack on the myelin sheath," according to Immunex. As patches of the myelin sheath are destroyed, they are replaced with scar tissue (i. Solvents in some inhalants, such as nail-polish remover, may dissolve the myelin sheath (fatty white layer) that protects and surrounds the brain's nerve cells. B-12 deficiency damages the myelin sheath surrounding the nerves, so that electrical impulses can't travel along them.